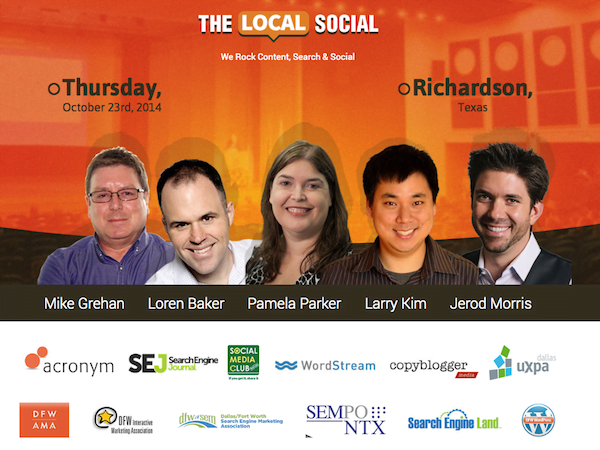 The Local Social, a grassroots networking collaboration of local marketing organizations, brings together well-known thought-leaders for discussions on search, social and content. This event brought together well-known industry leaders to discuss search, content and social tactics as well as an open forum for sharing questions and ideas that help businesses. The first annual Local Social event took place in 2013 and was an astounding success but the 2014 turnout was even bigger! This was owing in large part to the DFW community’s willingness to support a great cause and the growing recognition that brain injuries impact people from all walks of life. The second annual Local Social was on Thursday, October 23rd in Richardson, Texas. 100% of the event proceeds was donated to TryMunity, a local charity and advocacy devoted to traumatic brain injury survivors. Read the blog post which highlighted some attendee favorite moments. The second annual Local Social event returned with a panel of national and local speakers to share their professional social and search expertise, with moderators Lissa Duty and Rob Garner. Bernadette Coleman, CEO of Advice Interactive Group, was host to the annual event and did an excellent job facilitating the day. Meet the 2014 Local Social Speakers. We had four keynote addresses, and the day opened with a TBI survivor sharing his story about Traumatic Brain Injury and how important the cause was to support. Mike Grehan immediately followed, who was not only humorous, but shared some very valid points relating to digital marketing. Daniel Wu and his team from Baidu/Gridsum was the lunch keynote speakers and they generously shared about the digital marketing landscape in China. Larry Kim, who closed out the day and greeted the audience with this is a digital marketing event and I am not going to make it easy on you. You are going to stretch your minds and leave with a list of items to implement. He shared some very important and relative items that related directly to Search Engine Marketing (SEM) and Pay-Per-Click (PPC). Check out the 2014 photo highlights. Visit TryMunity.com to learn more about TBI and the non-profit organization.